This is the moment when a newspaper claiming to uphold that most essential function in a liberal democracy – acting as a watchdog on power – formally abandons the task. This is the moment when it positively embraces the role of serving as a mouthpiece for the government. The tell is in one small word in a headline on today’s Guardian’s front page: “Revealed”. It is no accident that the government chose the Guardian as the place to publish this “exclusive” press release. That single word “Revealed” in the headline serves two functions that reverse the very rationale for liberal, watchdog-style journalism. First, it is designed to disorientate the reader in Orwellian – or maybe Lewis Caroll – fashion, inverting the world of reality. The reader is primed for a disclosure, a secret, and then is spoonfed familiar government propaganda: that the tentacles of a Russian octopus are everywhere, that the Reds are again under our beds – or at least, poisoning our door handles. British diplomats plan to use four major summits this year – the G7, the G20, Nato and the European Union – to try to deepen the alliance against Russia hastily built by the Foreign Office after the poisoning of the former Russian double agent Sergei Skripal in Salisbury in March. This – and thousands of similar examples we are exposed to every day in the discourse of our politicians and media – is the way our defences are gradually lowered, our critical thinking weakened, in ways that assist those in power to launch their assault on democratic norms. 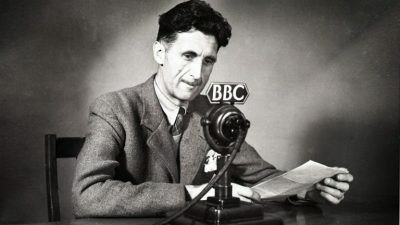 Through such journalistic fraud, liberal media like the Guardian and BBC – because they claim to be watchdogs on power, to defend the interests of the ruled, not the rulers – serve a vital role in preparing the ground for the coming changes that will restrict dissent, tighten controls on social media, impose harsher laws. Putin is waging an information war designed to turn our strongest asset – freedom of speech – against us. Russia is trying to fix us through deception. Second, there is a remedy for the disorientation created by that small word “Revealed”. It subtly forces the reader to submit to the inversion. For the reasons set out above, a rational response to this front-page story is to doubt that Wintour, his editors, and the Guardian newspaper itself are quite as liberal as they claim to be, that they take seriously the task of holding power to account. It is to abandon the consoling assumption that we, the 99 per cent, have our own army – those journalists in the bastions of liberal media like the Guardian and the BBC – there to protect us. It is to realise that we are utterly alone against the might of the corporate world. That is a truly disturbing, terrifying even, conclusion. But that sense of abandonment and dread can be overcome. The world can be set to rights again – and it requires only one small leap of faith. If Russian president Vladimir Putin truly is an evil mastermind, if Russia is an octopus with tentacles reaching out to every corner of the globe, if there are Russian agents hiding in the ethers ready to deceive you every time you open your laptop, and Russian cells preparing to fix your elections so that the Muscovian candidate (Donald Trump, Jeremy Corbyn?) wins, then the use of that “Revealed” is not only justified but obligatory. 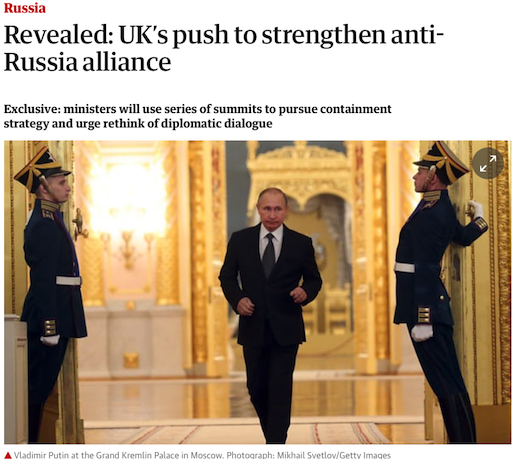 The Guardian isn’t spouting British and US government propaganda, it is holding to account the supremely powerful and malevolent Russian state. Once you have stepped through this looking glass, once you have accepted that you are living in Oceania and in desperate need of protection from Eurasia, or is it Eastasia?, then the Guardian is acting as a vital watchdog – because the enemy is within. Our foe is not those who rule us, those who have all the wealth, those who store their assets offshore so they don’t have to pay taxes, those who ignore devastating climate breakdown because reforms would be bad for business. No, the real enemy are the sceptics, the social media “warriors”, the political activists, even the leader of the British Labour party. They may sound and look harmless, but they are not who or what they seem. There are evil forces standing behind them. In this inverse world, the coming draconian changes are not a loss but a gain. You are not losing the rights you enjoy now, or rights you might need in the future when things get even more repressive. The restrictions are pre-emptive, there to protect you before Putin and his bots have not only taken over cyberspace but have entered your living space. Like the aggressive wars of “humanitarian intervention” the west is waging across the oil-rich areas of the Middle East, the cruelty is actually kindness. Those who object, those who demur, do so only because they are in the financial or ideological grip of the mastermind Putin. This is the moment when war becomes peace, freedom becomes slavery, ignorance becomes strength.